A supervolcano is a volcano that produces the largest and most voluminous kinds of eruption on Earth.The term "supervolcano" implies an eruption of magnitude 8 on the Volcano Explosivity Index, meaning that more than 1,000 cubic kilometers (240 cubic miles) of magma (partially molten rock) are erupted. The most recent such event on Earth occurred 74,000 years ago at the Toba Caldera in Sumatra, Indonesia. The power of such eruptions varies, but the volume of ejected material is enough to radically alter the landscape and severely affect global climate for years, with cataclysmic consequences for life. The term was originally coined by the producers of the BBC popular science program, Horizon, in 2000 to refer to these types of eruption. A supervolcano eruption packs the devastating force of a small asteroid colliding with the earth and occurs 10 times more often--making such an explosion one of the most dramatic natural catastrophes humanity should expect to undergo. The Caldera. Long Valley Caldera a 15- by 30-km oval-shaped depression located 20 km south of Mono Lake along the east side of the Sierra Nevada in east-central California. This area of eastern California has produced numerous volcanic eruptions over the past 3 million years, including the massive caldera-forming eruption 760,000 years ago. The most recent eruption occurred just 250 years ago in Mono Lake at the north end of Mono-Inyo Craters volcanic chain. Volcanic Unrest. In May of 1980, a strong earthquake swarm that included four magnitude 6 earthquakes struck the southern margin of Long Valley Caldera associated with a 25-cm, dome-shaped uplift of the caldera floor. These events marked the onset of the latest period of caldera unrest that continues to this day. This ongoing unrest includes recurring earthquake swarms and continued dome-shaped uplift of the central section of the caldera (the resurgent dome) accompanied by changes in thermal springs and gas emissions. USGS Monitoring. In 1982, the U.S. Geological Survey under the Volcano Hazards Program began an intensive effort to monitor and study geologic unrest in Long Valley caldera. The goal of this effort is to provide residents and civil authorities in the area reliable information on the nature of the potential hazards posed by this unrest and timely warning of an impending volcanic eruption, should it develop. Most, perhaps all, volcanic eruptions are preceded and accompanied by geophysical and geochemical changes in the volcanic system. Common precursory indicators of volcanic activity include increased seismicity, ground deformation, and variations in the nature and rate of gas emissions. 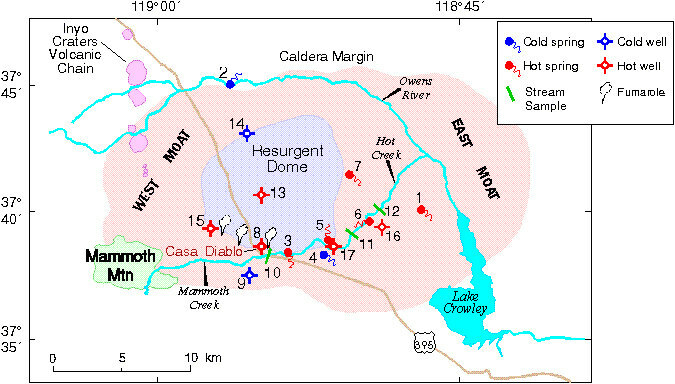 Map of Long Valley caldera showing locations of selected USGS hydrologic monitoring sites, the geothermal well field at Casa Diablo, and various geologic features referred to in the text. Numbered sites are described in the table below, which lists the maximum temperature in wells or the vent temperature in springs. The geologic features include Mammoth Mountain (the site of anomalous gas discharge that is killing trees), the Resurgent Dome (a highland region formed by repeated volcanic eruptions and magmatic uplift following the initial formation of the caldera 760,000 years ago), and the Inyo Craters Volcanic Chain consisting of numerous volcanic domes and phreatic craters that have erupted repeatedly over the past 10,000 years or so. The 22-km-wide Valles caldera was formed as a result of two large volume eruptions that created the widespread Bandelier Tuff ignimbrite plateaus on all sides of the caldera. 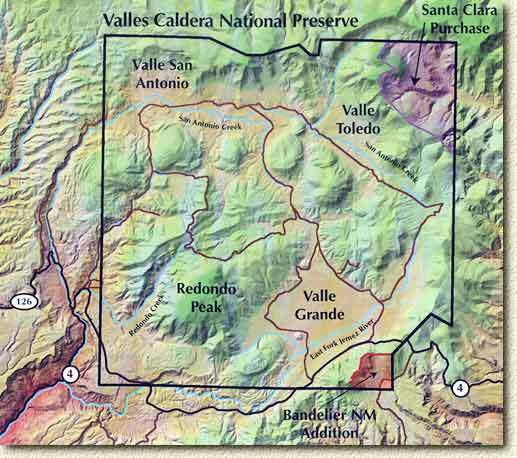 The lower member of the Bandelier Tuff, the Otawi, was emplaced about 1.7 million years ago (Ma) and resulted in the formation of most of the present-day Valles caldera, including the Toledo embayment at the NE side. The upper member, the Tshirege, is dated about 1.2 Ma, and also deposited voluminous welded pyroclastic flows over about the same area as the Otawi member. Post-caldera volcanism has included the emplacement of multiple ring-fracture lava domes and uplift of the caldera floor, forming the Redondo Peak resurgent dome. The El Cajete Pumice, Battleship Rock Ignimbrite, Banco Bonito Rhyolite, and the VC-1 Rhyolite were emplaced during the youngest eruption of Valles caldera, about 50,000-60,000 years ago. Seismic investigations show that a low-velocity zone lies beneath the caldera, and an active geothermal system with hot springs and fumaroles exists today. The one million-year-old Valles Caldera (15-mi diameter) is the centerpiece of the Jemez Volcanic Field in North Central New Mexico. The caldera was formed when the volcanic pile collapsed in response to a huge eruption of ash from the magma chamber. 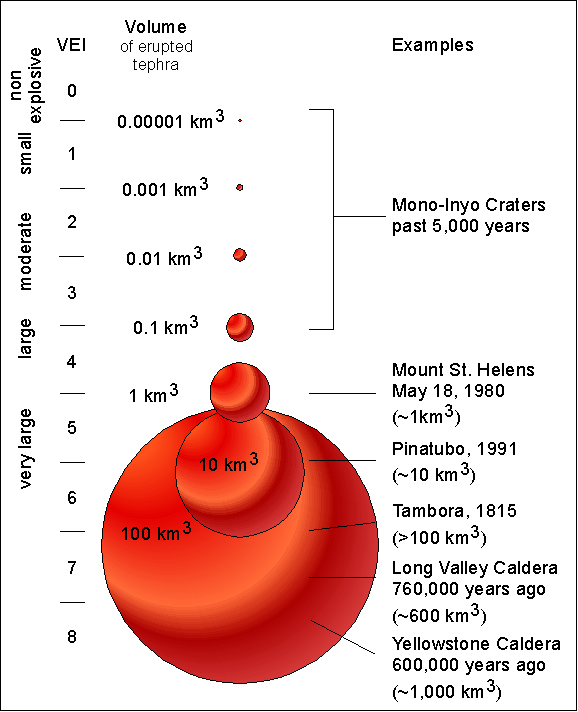 The 35 x 100 km Toba caldera, the Earth's largest Quaternary caldera, was formed during four major Pleistocene ignimbrite-producing eruptions beginning at 1.2 million years ago. The latest of these produced the Young Toba Tuff (YTT) about 74,000 years ago. The YTT represents the world's largest known Quaternary eruption, ejecting about 2500-3000 cu km (dense rock equivalent) of ignimbrite and airfall ash from vents at the NW and SE ends of present-day Lake Toba. Resurgent doming forming the massive Samosir Island and Uluan Peninsula structural blocks postdated eruption of the YTT. Additional post-YTT eruptions include emplacement of a series of lava domes, growth of the solfatarically active Pusukbukit volcano on the south margin of the caldera, and formation of Tandukbenua volcano at the NW-most rim of the caldera. Lack of vegetation suggests that this volcano may be only a few hundred years old (Chesner and Rose, 1991). One of the largest known volcanic eruptions took place only 74,000 yrs ago, when over 2500 cubic kilometers of magma was ejected from Toba - a volcano-tectonic depression that is often referred to as Earth's largest Quaternary caldera. 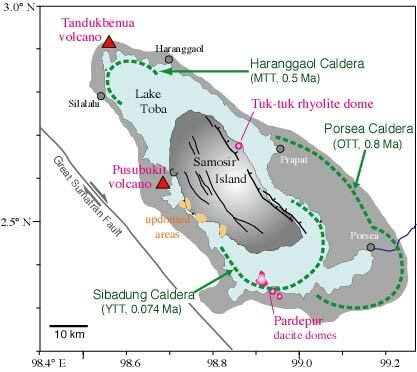 The caldera is 18 x 60 miles (30 by 100 km) and has a total relief of 5,100 feet (1700 m).Over what was probably a two-week span, thousands of cubic kilometers of debris spewed from Toba Caldera on northern Sumatra. Pyroclastic flows (fast-moving clouds of hot gas, rock fragments, and ash) buried at least 20,000 square kilometers around the caldera. As far away as India, ash from the Toba eruption lies in layers up to 6 meters (about 20 feet) thick; on Samosir Island, the ash layer is more than 600 meters (more than a quarter mile) thick. Image courtesy of NASA/GSFC/MITI/ERSDAC/JAROS, and the U.S./Japan ASTER Science Team. Following the eruption, the ground collapsed, leaving the modern caldera, which filled with water to make Lake Toba. 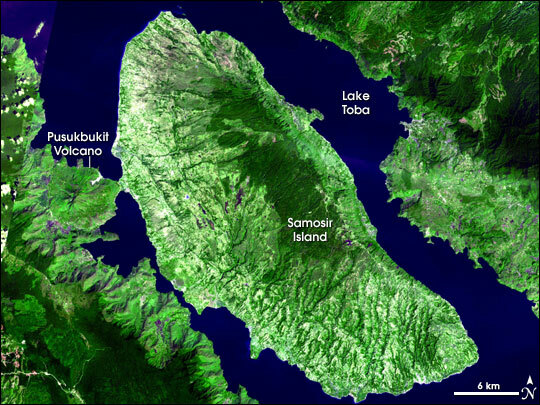 Samosir Island is a resurgent volcanic dome, a mound of rock uplifted by pressure from un-erupted magma in the chamber beneath the volcano. The Pusukbukit Volcano on the western shore of the lake also formed after the catastrophic eruption. The caldera probably formed in stages. 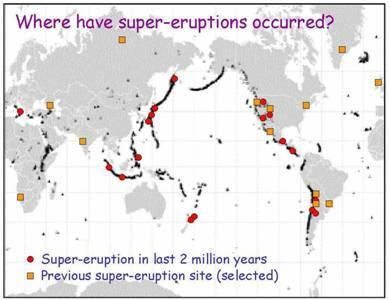 Large eruptions occurred 840,000, about 700,000, and 75,000 years ago. The eruption 75,000 years ago produced the Young Toba Tuff. The Young Toba Tuff was erupted from ring fractures that surround most or all of the present-day lake. Taupo Volcano has been in existence for more than 65 000 years. In that time it has shown a random pattern of exceptionally large events interspersed by smaller eruptions. This is a pattern typical of all the major rhyolite volcanoes of the central North Island and together they have produced large eruptions about every 50,000 years. 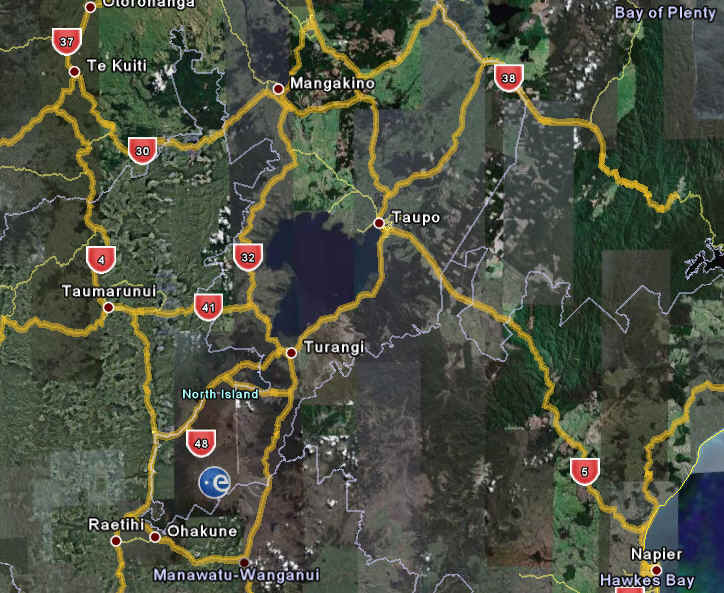 At Taupo the Oruanui and the Taupo eruptions are part of this larger pattern. All deposits at Taupo including a number of early lava domes clearly post-date the exceptionally large Whakamaru ignimbrite eruption dated at 330,000 years ago. About 150,000 years ago new activity formed a pumice-rich ignimbrite found along the northern shores of the lake, several basalt scoria cones and tuff rings about Acacia Bay and Mt. Tauhara. Our knowledge of this time intervals is very incomplete as few deposits of this age are exposed. Between 65,000 years and 27,000 years ago there was a series of at least five explosive eruptions, from vents now under Lake Taupo. The older four eruptions produced layers of coarse pumice. The youngest produced fine grey ash suggesting the mixing of lake water with erupting magma. The largest eruption from Taupo occurred 26,500 years ago producing 300 km³ of ignimbrite, 500 km³ of pumice and ash fall and a unknown volume of material inside the caldera. 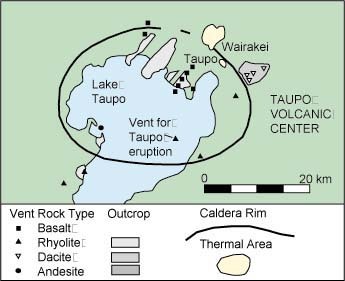 The Oruanui eruption is thought to have formed the caldera now filled by Lake Taupo, but this large eruption also shows the influence of lake water in its fine grain size and abundant evidence for heavy rain during the eruption. This implies the existence of a large lake prior to the eruption. The Oruanui ignimbrite is seen in many road cuttings about Taupo, draped by the layers of younger tephra. Fine ash from this eruption has been found throughout New Zealand and in many offshore core samples. Aira Caldera is a gigantic volcanic caldera in the south of the island of Kyushu, Japan. The caldera was created by a massive eruption, approximately 22,000 years ago. The major city of Kagoshima, Kagoshima and the 13,000 year old Sakurajima volcano lies within the caldera. Sakura-jima, one of Japan's most active volcanoes, is a post-caldera cone of the Aira caldera at the northern half of Kagoshima Bay. Eruption of voluminous pyroclastic flows accompanied formation of the 17 x 23 km wide Aira caldera at the eruption 22,000 years ago. Together with a large pumice fall, these amounted to more than 400 km3 of tephra. The active volcano Sakura-Jima on the island of Kyushu, Japan is shown in the center of this radar image. The volcano occupies the peninsula in the center of Kagoshima Bay, which was formed by the explosion and collapse of an ancient predecessor of today's volcano. The volcano has been in near continuous eruption since 1955. Its explosions of ash and gas are closely monitored by local authorities due to the proximity of the city of Kagoshima across a narrow strait from the volcano's center, shown below and to the left of the central peninsula in this image. City residents have grown accustomed to clearing ash deposits from sidewalks, cars and buildings following Sakura-jima's eruptions. The volcano is one of 15 identified by scientists as potentially hazardous to local populations, as part of the international "Decade Volcano" program. 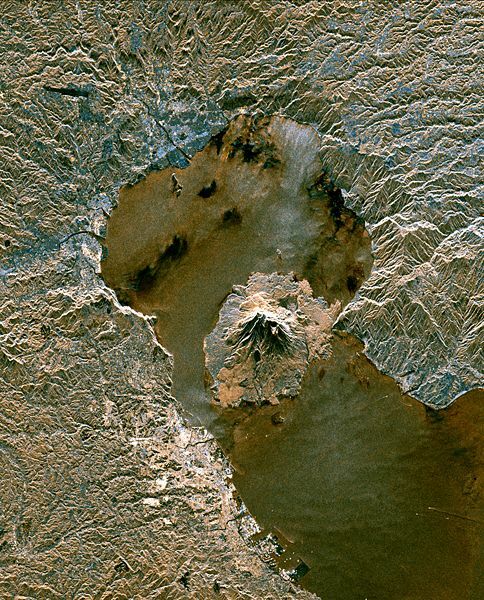 About 22,000 years ago a series of large-scale pyroclastic eruptions produced the Aira caldera (20 km×20 km wide at the northern end of Kagoshima Bay in southern Kyushu. It started with a Plinian pumice erution (Osumi pumice fall, 98 km3) followed by oxidized, fine-grained Tsumaya pyroclastic flow (13 km3), both erupted from a vent located at the present site of Sakuraijima volano, 8 km south of the caldera center. After a very short pause, violent explosive ejection of the basement rock fragments and pumiceous materials occurred at the central vent, gradually changing itself to a huge eruption column rapidly collapsing to form the Ito pyroclastic flow about 300 km3 in volume. The earliest phase produced up to 30-m-thick Kamewarizaka breccia developed along the caldera rim and charged with basement (lithic) fragments up to 2 m across. The breccia is a near-vent variety of the bottom concentration zone of lithics in the Ito deposit. Various textural features and monotonous petrologic character indicate that the main part of the Ito pyroclastic flow was emplaced by a simple, short-lived eruptive mechanism. The Aira-Tn ash, a fine-grained counterpart of the Ito pyroclastic flow, covered a wide area more than 1000 km from the vent. Evacuation of more than 110 km3 of rhyolitic magma produced a funnel-shaped collapse structure with the center of the magma chamber about 10 km deep. Like many other Japanese Quaternary calderas, the Aira caldera is considered to have formed not by a piston cylinder-type subsidence utilizing a ring fracture but by coring and high-angle slumping of the wall rocks into a funnel-shaped central vent. The outline of the caldera was strongly controlled by the faults bounding the volcano-tectonic graben forming Kagoshima Bay. 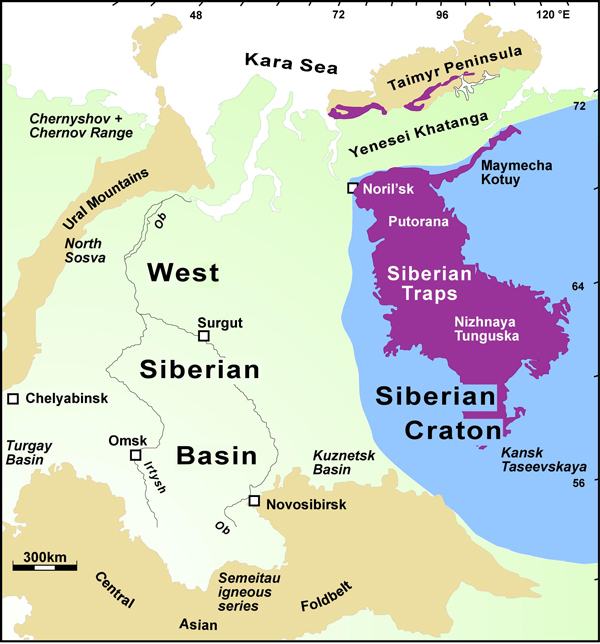 The Siberian Traps were the largest volcanic eruption in Earth history and they occurred right at the same time as the largest extinction event in Earth history. About 252 million years ago, the largest mass extinction and the largest volcanic eruptions in Earth history occurred apparently synchronously: Worldwide ~90% of marine species and ~70% of terrestrial species went extinct In Siberia ~6,000,000 cubic kilometers of magma erupted, enough to cover the continental U.S. to almost a mile in depth. 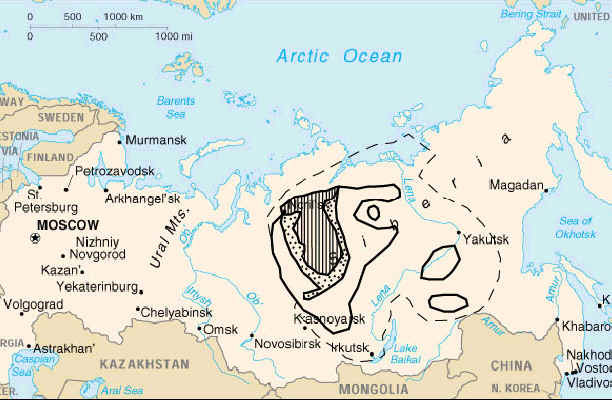 The Siberian Traps form a large igneous province in Siberia. The massive eruptive event spans the Permian-Triassic boundary, about 251 to 250 million years ago, and was essentially coincident with the Permian-Triassic extinction event in what was one of the largest known volcanic events of the last 500 million years of Earth's geological history. The term 'traps' is derived from the Swedish word for stairs (trappa, or sometimes trapp), referring to the step-like hills forming the landscape of the region. Vast volumes of basaltic lava paved over a large expanse of primeval Siberia in a flood basalt event. Today the area covered is about 2 million km² and estimates of the original coverage are as high as 7 million km². The original volume of lava is estimated to range from 1 to 4 million km³. The area covered lies between 50 and 75 degrees north latitude and 60 to 120 degrees east longitude. The volcanism continued for a million years and spanned the Permian-Triassic boundary.